Cuius regio, eius religio is a phrase in Latin loosely translated as "Whose realm, his religion". In other words, the religion of the ruler dictated the religion of the ruled. The rulers of the German-speaking states and the Charles V, Holy Roman Emperor, agreed to the principle in the Peace of Augsburg (1555), which ended armed conflict between the Catholic and Protestant forces in the Holy Roman Empire. The principle applied to most of the territories of the Empire, with the exception of the several of the sovereign families and Imperial cities and the Ecclesiastical principalities, whose issues were addressed under separate principles (see Ecclesiastical reservation and Declaratio Ferdinandei). The principle only extended legitimacy to two religions within the Empire, Catholicism and Lutheranism, leaving out such reformed religions as Calvinism, and such radical religions as Anabaptism; any other practice of worship beyond the two legal forms was expressly forbidden and legally considered a heresy, a crime punishable by death. Although not intended to offer the modern idea of "freedom of conscience," individuals who could not subscribe to the prince's religion were permitted to leave the territory with their possessions. While the Peace of Augsburg (1555) generally, and the principle of cuius regio, eius religio specifically, marked the end of the first wave of organized military action between Protestants and Catholics, but its limitations did not address the developing emerging trend toward religious pluralism throughout the German-speaking lands of the Holy Roman Empire. Charles V, Holy Roman Emperor, instructed his brother to settle disputes relating to religion and territory at the Augsburg Diet in 1555. Prior to the 16th century, there had been one faith in a Christian land, and that was the catholic, or universal, faith. Martin Luther's agenda called for the reform of the universal Church, but was not necessarily a rejection of the faith per se. Initially dismissed by Holy Roman Emperor Charles V as an inconsequential argument between monks, the idea of reformation of the Church accentuated controversies and problems in many of the territories of the Holy Roman Empire. The reform theology galvanized social action in the Peasant Revolts (1524–1526), which were brutally repressed and the popular political and religious movement crushed. In 1531, fearful of a repetition of similar suppression against themselves, several Lutheran princes formed the Schmalkaldic League, an alliance through which they agreed to protect themselves and each other from territorial encroachment, and which functioned as a political alliance against Catholic princes and armies. It was broadly understood by princes and clergy alike that institutional abuses hindered the practices of the faithful. In 1537, Pope Paul III had called a council to examine abuses and to suggest and implement reforms. In addition, he instituted several internal reforms. Despite these efforts, and the cooperation of Charles V, unification of the two strands of belief foundered on different concepts of “Church” and the principle of justification. In the same year, the Schmalkaldic League called its own ecumenical council, and posited several precepts of faith; Luther was present, but too ill to attend the meetings. When the delegates met again, this time in Regensburg in 1540–41, representatives could agree on the doctrine of faith and justification, but not on the number of sacraments, especially whether or not confession, and absolution were sacramental, and they differed widely on definition of the church. Catholic and Lutheran adherents seemed further apart than ever; in only a few towns and cities were Lutherans and Catholics able to live together in even a semblance of harmony. By 1548, political disagreements overlapped with religious issues, making any kind of agreement seem remote. In 1548 Charles declared an interreligio imperialis (also known as the Augsburg Interim) through which he sought to find some common ground. This effort succeeded in alienating Protestant and Catholic princes and the Curia; even Charles, whose decree it was, was unhappy with the political and diplomatic dimensions of what amounted to half of a religious settlement. The 1551–52 sessions convened by Pope Julius III at the supposedly ecumenical Council of Trent solved none of the larger religious issues but simply restated Catholic teaching and condemnation of Protestant heresies. Catholic and Protestant ideology seemed further apart than ever. Charles' interim solution satisfied no one. He ordered a general Diet in Augsburg at which the various states would discuss the religious problem and its solution; (this should not be confused with the Diet of Augsburg in 1530). He himself did not attend, and delegated authority to his brother, Ferdinand, to "act and settle" disputes of territory, religion and local power. At the conference, Ferdinand cajoled, persuaded and threatened the various representatives into agreement on three important principles. Cuius regio, eius religio, Ecclesiastical reservation, and the Declaration of Ferdinand. The principle of Cuius regio, eius religio provided for internal religious unity within a state: The religion of the prince became the religion of the state and all its inhabitants. Those inhabitants who could not conform to the prince's religion were allowed to leave, an innovative idea in the 16th century; this principle was discussed at length by the various delegates, who finally reached agreement on the specifics of its wording after examining the problem and the proposed solution from every possible angle.Cuius regio, eius religio went against earlier Catholic teaching which held that the kings should faithfully obey the pope. This obedience was thought to produce greater fruits of cooperation and less political infighting and fewer church divisions. The phrase cuius regio, eius religio as applied to the outcome is attributed to the early seventeenth century (1612, by the jurist Joachim Stephani (1544-1623) of the University of Greifswald ). The second principle covered the special status of the ecclesiastical states, called the ecclesiastical reservation, or reservatum ecclesiasticum. If the prelate of an ecclesiastic state changed his religion, the men and women living in that state did not have to do so. Instead, the prelate was expected to resign from his post, although this was not spelled out in the agreement. The third principle, known as Ferdinand's declaration, exempted knights and some of the cities from the requirement of religious uniformity, if the reformed religion had been practiced there since the mid-1520s, allowing for a few mixed cities and towns where Catholics and Lutherans had lived together. It also protected the authority of the princely families, the knights and some of the cities to determine what religious uniformity meant in their territories. Ferdinand inserted this at the last minute, on his own authority. After 1555, the Peace of Augsburg became the legitimating legal document governing the co-existence of Lutheran and Catholic faiths in the German lands of the Holy Roman Empire, and it served to ameliorate many of the tensions between followers of the so-called Old Faith and the followers of Luther. It had two fundamental flaws. First, Ferdinand had rushed the article on ecclesiastical reservation through the debate; it had not undergone the scrutiny and discussion that attended the acceptance of Cuius regio, eius religio. Consequently, its wording did not cover all, or even most, potential legal scenarios. His ad hoc Declaratio Ferdinandei was not debated in plenary session at all; instead, using his authority to "act and settle," he had added it at the last minute, responding to lobbying by princely families and knights. Ferdinand, King of the Romans after 1531 and Holy Roman Emperor (1555-1564). These specific failings came back to haunt the Empire in subsequent decades, perhaps the greatest weakness of the Peace of Augsburg was its failure to take into account the growing diversity of religious expression emerging in the so-called evangelical and reformed traditions. By 1555, the reforms proposed by Luther were no longer the only possibilities of religious expression: Anabaptists, such as the Frisian Menno Simons (1492–1559) and his followers, the followers of John Calvin, who were particularly strong in the southwest and the northwest, or those followers of Huldrych Zwingli, were excluded from considerations and protections under the Peace of Augsburg. According to the Religious Peace, their religious beliefs remained heretical. No agreement was reached on the question of whether Catholic bishops and abbots who became Lutheran should lose their offices and incomes, until the reservatum ecclesiasticum was inserted by imperial decree. The validity of this insertion was contested in a five-year war between the Protestant-convert Archbishop-Elector of Cologne, Gebhard Truchsess von Waldburg, and his Catholic-replacement Ernest of Bavaria, with the latter's victory upholding it. The ideal of individual religious tolerance on a national level was, however, not addressed: neither the Reformed nor Radical churches (Calvinists and Anabaptists being the prime examples) were protected under the peace (and Anabaptists would reject the principle of cuius regio eius religio in any case). 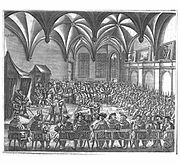 Many Protestant groups living under the rule of a Lutheran prince still found themselves in danger of the charge of heresy. Tolerance was not officially extended to Calvinists until the Peace of Westphalia in 1648, and most Anabaptists eventually relocated to the New World or were exterminated. Brodek, Theodor V (1971). "Socio-Political Realities of the Holy Roman Empire". Journal of Interdisciplinary History 1 (3): 395–405. 1971. Jedin, Hubert, Konciliengeschichte, Freiburg, Herder, 1980, ISBN 9780816404490. Sutherland, N.M. . "Origins of the Thirty Years War and the Structure of European Politics". The English Historical Review 107 (424): 587–625. 1992.